Do You Know "NED?" The NY Nonprofit Executive Director (NED) Network Blog, that is. New York Council of Nonprofits, formerly Council of Community Services of New York State, is proud to launch into the blogosphere with our network of executive director peer groups from around the state. Find out what is going on with other execs by connecting to NED. Keep "in the know," ask questions of your colleagues, keep up with the latest news that will improve your performance, enhance your professional development and support your challenging and rewarding work as a nonprofit leader. Founded in 1927, the New York Council of Nonprofits, formerly Council of Community Services of New York State, Inc. (CCSNYS), is a 501(C)(3) membership-based, mission-driven, statewide association of diverse charitable nonprofit organizations. With over 1,500 members, we work to build the capacity of nonprofits and communities to enhance the quality of life through responsive, cost-effective service. 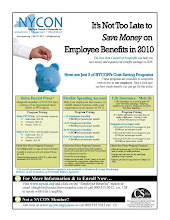 Consider joining NYCON today!